Marshall Henderson has been busy since his Ole’ Miss squad lost in the 2nd round of the NCAA tournament. Once his season ended, which included his giving fans the finger, and the media celebrated his contributions to the tournament, he moved onto more important activities: encounters with the police. In fact since March he has several face-to-face visits with the police, including a May stop where after being pulled over for speeding, he was found to be in possession of both marijuana and cocaine. Ultimately, he wouldn’t be charged with any drug crimes, but instead was citied for not having insurance. Say, what? Given his history, and the draconian nature of American drug policy, the lack of intervention from the criminal justice system should give pause. Reports of this and other incidents only surfaced after his coach announced that he was suspended indefinitely (not kicked off the team; not removed from school) from the team for violating “team rules” (as opposed to state law or school policies). The media response to the suspension and to the reported arrests has been muted to say the least. Called a “knucklehead;” “someone who has been enjoying himself;” as someone who is “battling a beast” and a sickness; as someone who keeps messing up; as someone who needs to get his life together, who needs help. Not a thug, not a menace, not a criminal; not someone who should be kicked off the team, kicked out of school or sent to jail. Understanding and compassion at every level. With these events, and his continued ability to cash in on his “whiteness,” to get a pass because he does not elicit racial fear and outrage, I continue to hate Marshall Henderson. There I said it. I hate that every time I see his name I am reminded as to white supremacy, about racial standards, of the history of the 3/5 clause, and of dreams deferred. I realized long ago that my disdain for all things Marshall runs deep, where I couldn’t help but sit in front of the television to watch Ole Miss-Florida in the SEC tournament finale. I am more likely to watch the Real Housewives of Iowa than an SEC basketball game, yet it was must see-TV because of my disdain for Marshall Henderson. From March until now, from his trash-talking to his arrests, from his 2nd and 10th chances, he is emblematic of the racial scripts that pervade American society. But let me clear, I am not a hater. I don’t have sour grapes; I got outrage to injustice and he is indicative of this entrenched injustice. My feelings have little to do with Marshall Henderson. I don’t know the man. Nor do I have an investment in his daily performance. My emotional reaction is not about Henderson himself but the narrative, the media coverage, and the double standards that he is embodies. “Marshall Henderson is the Charlie Sheen of college basketball – an unapologetic poster-child of white privilege,” notes Charles Moriano. “Despite a litany of on and off-court behavior that normally send sports media pundits into “what about the kids” columns with African-American athletes, Henderson has been most often been described as ‘passionate’, ‘colorful’, and ‘entertaining’.” Greg Howard describes the double standards that anchor the media response. This past fall, Cardale Jones, a student-athlete at Ohio State University, had the audacity to tweet: “Why should we have to go to class if we came here to play FOOTBALL, we ain’t come to play SCHOOL classes are POINTLESS.” Not surprisingly, he was pillared, critiqued, and cited as evidence of what’s wrong with today’s student-athlete. There were no headlines about his refreshing challenge to political correctness and no celebratory articles about his free-spirit and the passion Jones has for his sport. 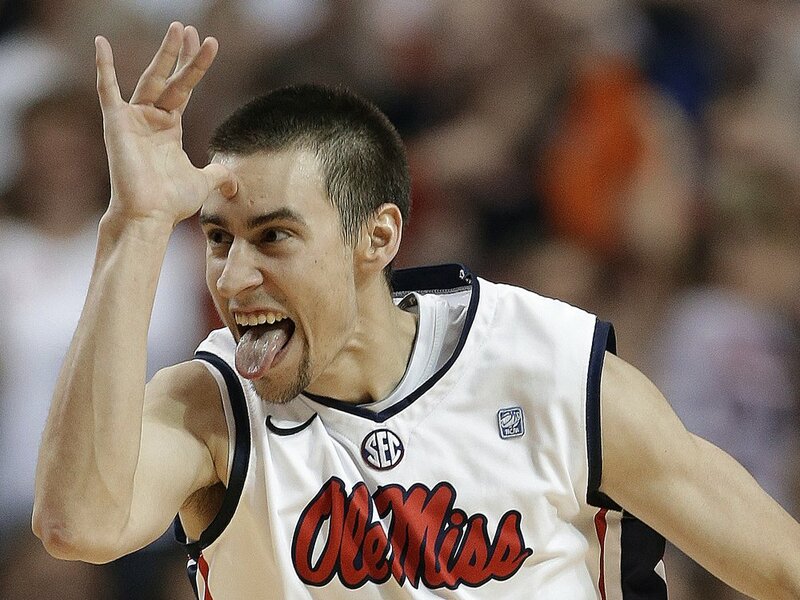 Marshall Henderson has had more collegiate addresses than John McCain has homes. He has taken his talents across the nation, playing in multiple time zones. He is the Bobby Petrino of collegiate basketball. Over three years, he has attended the University of Utah, Texas Tech University, South Plains Community College, and Ole Miss. Yet, the story told has not been one of a checkered past or an ability to commit, but instead one worthy of celebration. He has travelled a difficult road in search of his dreams. Despite a Kardashian-esque level of commitment, Henderson’s road to the NCAA tournament has come to signify his “rags-to-riches” story of redemption. His past is evidence of the difficulty he has overcome and why ultimately we should love him. Henderson is praised for the “joy” and “passion” he plays with, yet every athlete is not created or critiqued equally. Not every athlete is entitled to taunt Florida fans, to shoot with reckless abandonment. Irrespective of fact that he shoots almost 15 shots a game, or fact that he shoots less than 40% from the field, he is depicted as scorer and an offensive talent. He is the 14th leading scorer in Division 1, yet has the lowest shooting percentage of any player in the top 40. The fact that he shoots and shoots and shoots is a sign of fearlessness and passion as opposed to arrogance and selfishness. 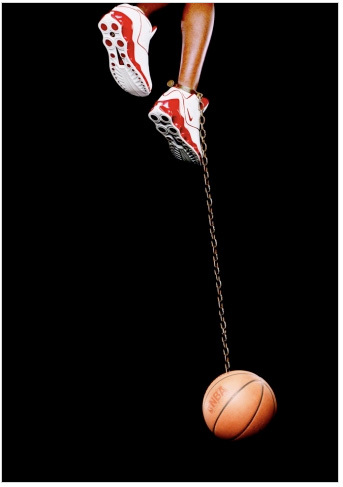 Henderson, despite embracing the aesthetics and practices long associated with hip-hop and blackness, is imagined as “breath of fresh air for an American public “‘tired of trash-talking, spit-hurling, head-butting sports millionaires.’” He is the walking embodiment of “everything but the burden.” According to CL Cole and David Andrews, “African American professional basketball players… are routinely depicted in the popular media as selfish, insufferable, and morally reprehensible.” Henderson is not burdened but instead celebrated for his “swagger” and “passion.” Each and everyday he is able to cash in on his whiteness. Yes, his whiteness. While his father Native American, and while his twitter name, reps his indigenous identity, in the world of basketball, whereupon blackness is imagined as “normative,” as “non-black baller” he becomes white before our eyes. He has a white pass, one he plays every time he sticks out his tongue or taunts an opponent. And he seems quite aware of his white privilege. While Henderson imagines himself as a victim, who is criticized because he is “a little white boy” who “talk trash to people and the fans” in the end he is lovable villain, a person worthy of celebration. He, unlike those other trash talkers, is a good kid and therefore should be judged unfairly because of them. The privileges cashed in by Henderson are not limited to the basketball arena. In 2009, according to a statement given to the secret service, Henderson, then a senior in high school, used “$800 of counterfeit money given to him by a friend to buy 59 grams of marijuana in two separate transactions.” With help from his coach and father, he was able to plea to a forgery charge, which led to a probation sentence. While at Texas Tech, Henderson violated his probation by testing positive for alcohol, marijuana, and cocaine, serving 25 days in jail along with 7 weekends of work release. Yet, he kept on playing basketball. Compare his experience to two other African American student-athletes at Ole Miss. Coach Andy Kennedy dismissed Dundrecous Nelson and Jamal Jones, following an arrest resulting from an officer discovering “eight roaches of marijuana made from cigarillos.” While Jones was released, both were dismissed from the team. As with Tyrann Mathieu, Nelson and Jones were held accountable in ways Henderson can only imagine. Headline after headline, commentator after commentator depicts Henderson as hated, polarizing, and a villain. Yet, this is our problem. We are told over and over again that we are just haters; that we have problems with him because at worse he has a “chip on a shoulder” and at worse because he has swagger. He is not a problem; it is us. We just need to learn to love him. No thank you. I wonder when the level of understanding will be demanded for those “hated,” “polarizing” trash-talking ballers with a swagger, who are African American? Maybe that is part of the post-racial fantasy we keep hearing about; until that is a reality, I will just keep hating Henderson, the sports, media, the NCAA, and those who chant “free Marshall.” More than that I will find outrage about the stories we tell and sell about him. In a week where the Trayvon Martin was put on trial in part because of marijuana use, where the ESPN Machine lamented over “yet another” drunk driving arrest in the NFL (yet again ignoring fact that NFL players are less likely to be pulled over for drunk driving than their peers outside the league) the differential reaction to Marshall Henderson’s arrests gives me pause. The disregard for his history is the power of the whiteness. The innocence seen is a sobering reminder of the separate and unequal nature of America’s criminal justice system, its media, and its other institutions. So when I say I hate Marshall Henderson, what I mean is I hate injustice, I hate double standards, I hate hypocrisy, I hate white supremacy, and I hate that amid claims that race doesn’t matter reality shows how it matters in real and sometimes life altering ways. The announcement that Justin Combs, son of Sean “Diddy” Combs, would take his talents – on the field and in the classroom – to UCLA has prompted widespread debate (err haterism). Despite excelling on the football field and with his academics, some have questioned whether he deserves or should be given a scholarship, especially in our current economic climate. More than the issue of the cost of collegiate athletics and rising tuition costs, the “controversy” surrounding his scholarship to UCLA comes from a belief that Combs is not entitled to an athletic scholarship because of his father’s wealth. The mere fact that this subject to debate on CNN or that CBS affiliate in Los Angeles sent a reporter to ask students their opinion is troubling and points to some larger issues at work. Justin Combs earned a scholarship; UCLA decided that his football skills and his academic preparedness were worthy of an athletic scholarship. That should be the end of the discussion yet for those who see his Diddy’s mogul status, his MTV Sweet 16 bash, his car, or his father’s stock portfolio as reasons to deny an earned, merit-based, scholarship, let me say a few things. First off, the scholarship is “compensation” for his athletic labor; it is payment for not only his hard work but also a skill set that has proven to be valuable. It is compensation for the job of being a student-athlete, one that not only includes practice, games, media sessions, film sessions, workouts, travel, physical and mental wear and tear, and public appearances, along with being a college athlete. 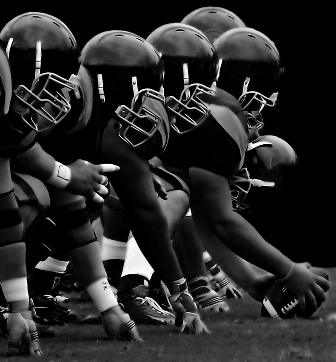 It is remuneration for the millions of dollars generated by collegiate football and basketball players, whose talents the NCAA, its partner institutions, and the sports media have converted into a billion dollar industry. While an exploitative relationship, this is still the “wage.” Unless the sons and daughters of America’s 1-percent are going to be asked to forgo wages at their various jobs, there is little one should say to Justin Combs. Second, the idea that budgets or student fees are being impacted by athletic scholarships is without basis. Beyond the reality that state monies are not used for athletic scholarships, the efforts to link Combs to the budget is faux outrage. Where is the outrage over excessive salaries for coaches? High-price administrators? High cost tuition has nothing to do with scholarship athletes, or “overpaid professors” but an overall divestment in higher education. It reflects an unwillingness to invest public monies, to raise the necessary tax dollars, to maintain great universities. 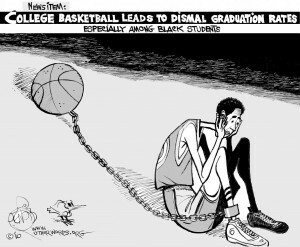 Blaming student-athletes and condemning Justin Combs is nothing more than a rhetorical weapon of mass distraction, one that so often cites hip-hop as the source of societal ills. Additionally, if one is going to “mean’s test” scholarships, wouldn’t that ostensibly eliminate all merit-based scholarships? Does that mean all scholarships will be allocated based on need or just when involving the sons and daughters of hip-hop moguls? For those who don’t think Combs deserves an athletic scholarship, are you willing to take the same position for a student who earns academic scholarship? If athletic excellence doesn’t matter for a student of wealth, should artistic or academic excellence matter either? Continue reading @ Why Shouldn’t Diddy’s Son Get a Scholarship? – Entertainment & Culture – EBONY.